Abstract: Japanese encephalitis (JE) is an infectious encephalitis prevalent in Asia. It usually presents with fever, headache, convulsions and extrapyramidal symptoms. Limbic system involvement and hypothermia though common in autoimmune encephalitis have never been reported in JE. We report a case of an 18-year-old girl with no previous comorbidities who presented to us with a history of fever and headache for 1 week duration. She developed bilateral lateral rectus palsy and asymmetric flaccid weakness of all four limbs, after 2 days of admission, which was followed by altered sensorium and intermittent hypothermia. 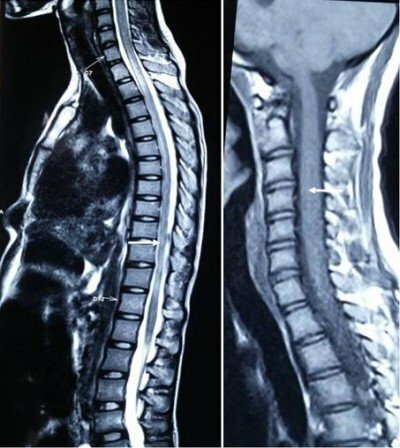 Neuroimaging revealed longitudinal myelitis extending from pons till the L1 level along with bilateral thalamic hemorrhage in brain. Cerebrospinal fluid (CSF) was positive for IgM antibody to JE virus. She was treated with supportive measures, but she developed intractable hypothermia and seizures and succumbed to illness after 2 weeks of admission.